The New York auction marks the final major auction for Sotheby’s for this year. The total sales figure is $46,420,875 compared to $53,935,050 last year, a 13.93% drop. If the 10 carat Vivid Blue would have sold, this drop in sale, would have ended up in an amazing increase. This year, nine items were sold for over $1 million each, representing a 40.5% of total sales. Last year ten items sold for over $1 million each, representing 58.8% of total sales. This year there were over 80 more items sold at the auction. 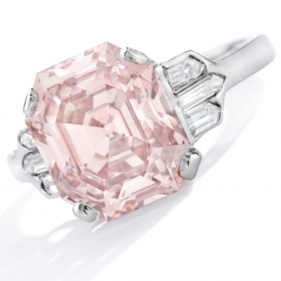 The top Fancy Color Diamond sold was the 6.46 carat, Fancy Orangy Pink Diamond with a VVS2 clarity. It had a really sweet color. It sold for $1,335,000 or $206.7K per carat, after an estimate of between $600k to $800k in total, a 67% premium to the high valuation. Apart from a few yellow diamonds that were sold during the auction, some of which were successful more than others, no other significant Fancy Color diamond was sold. 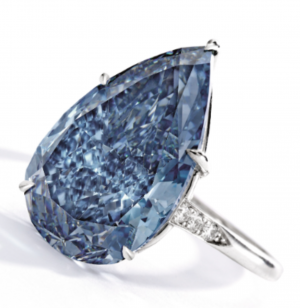 The 10.62 carat, Fancy Vivid Blue Diamond with VVS1 clarity did not reach the $20 million minimum mark. Why is that? I will address it in my end of year summary report for 2018. 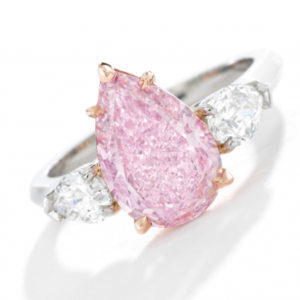 The 2.76 carat, Fancy Intense purple-pink with VVS1 also did not reach the minimum of $1.3 million. 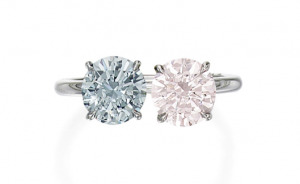 The Fancy Gray-Blue with Fancy Pink round diamond ring also went unsold by not reaching the $300k mark. Sotheby’s closed the season on a negative note, but then again, we can also concentrate more on the good and positive. It is our choice how to perceive things. Watch out for the year end full review before the end of the year. Happy Holidays to all!